The world tallest and longest-necked land animal, a fully-grown giraffe can measure up to 5.5m high. 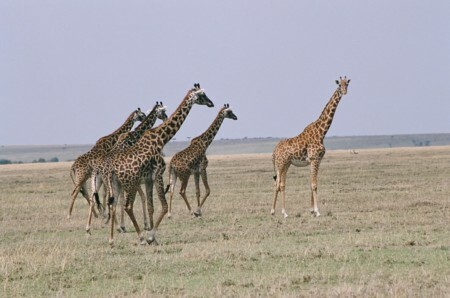 They live in loosely structured herds of up to 15 head and are often seen singly or in small groups. Both male and females have distinctive, stumpy horns – on the females these have tufts. Other characteristics are the short mane, high shoulders sloping down to their haunches and thin tail with a tufted end. To drink, they must either straddle or bend the forelegs. Once you have seen what kind of effort this require, you completely appreciate the effort and can understand why they are so alert when at the waterhole. They have an ungainly run, which looks more like a gallop and their docile appearance is deceptive. A kick is powerful enough to kill a man. They browse on trees and bushes. There are three subspecies found in Kenya. Commonly seen is the Masai: recognized from other giraffe species due to its irregular pattern of tan and yellow colored markings. 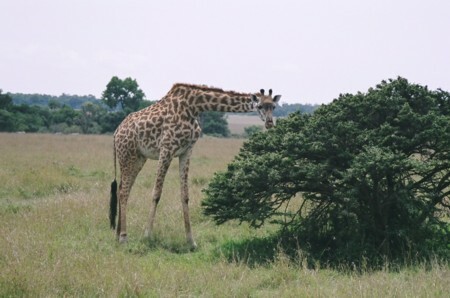 Rothschild’s: is sometimes mistaken for a Masai giraffe, but it has paler markings, with no spots below the knee and on the male there’s pronounced forehead, sometimes giving the impression of three horns. It is seen at Lake Nakuru National Park and Kigio Wildlife Conservancy. The idea that these animals are mute is a myth! Though normally silent, calves bleat and make a mewing call, cows seeking lost calves bellow, and courting bulls may emit a raucous cough. They also give alarm snorts, and moaning, snoring, hissing, and flute-like sounds have been reported. Note: As of 2011 the Reticulated & Rothschild’s are listed under 'endangered' and are in desperate need of protection. I have witnessed once the 'fight' between two adult males, also known as 'necking'. 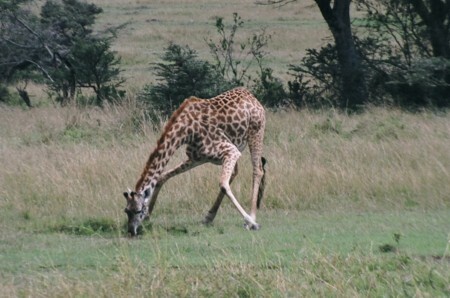 Necking is used to establish dominance and can occur at low intensity or high intensity. Thankfully it was a low intensity that we encountered and that was just enough to handle.